Bolivian Christmas 101: Rag dolls and brass cars: how about those times! Rag dolls and brass cars: how about those times! The children of the 40s and 50s remember Christmas back then and say that it was full of faith. Some molded Jesus in clay and others went out to worship him. 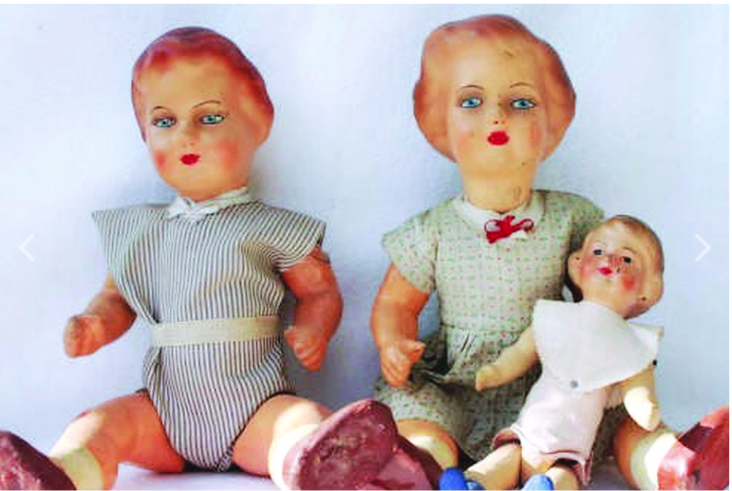 A rag doll or a brass truck were the most desired toys as a Christmas gift for the children of La Paz in the 40s and 70s of the last century. This is what some of those kids say today at 70 years old and remember with nostalgia this festivity that – they say – in those times was more full of faith than now. “There was a small gift, not like now. The most important thing was to be with the family to wait for the birth of the Child God,” says Betty Terrazas, who was born in Miraflores, in 1946. However, the first Christmas he remembers is the one in which he was eight years old and his parents gave him Rubí, a long-legged rag doll. I did not let go of that doll, until it was stolen by a little friend,” he says. Felix Vargas brings to mind the first little brass truck that his parents gave him. “It was made in Japan,” he recalls with visible pride. “Before there was not as much toy as now and the few that were there, were expensive, like a luxury. My dad worked in a company and they brought the toys,” says Rosa, who was born in 1940 in the Yungas of La Paz. “But they were very expensive and for most of us it was a luxury to have such a toy. We had to settle for the little cars that we used to make medicine boxes with the corks from the soda lids,” he says. “The children of people who had money had as gifts: skateboards, bicycles, little cars or rag dolls or plaster with a porcelain face,” he adds. And the way to deliver those presents was very special. Juana Portillo, who was born in 1934, remembers that on December 24, on Christmas Eve, after the picana, her parents made them leave her and her brothers’ stockings in the window, because Santa [Papanoel] arrived that night bringing gifts. “They were usually sweets and cookies,” he says. Felix Vargas remembers that in his case, his parents made him take his shoes by the door so that when Papanoel passed by, he would leave his gift. “It was a night full of beliefs,” he says. But in those times, not only the gifts were scarce, but also the Nativity scene; This is the story of the family of Alfredo Castro who was born in 1940 in the area of the cemetery. He tells how with his brothers they made their own Nativity scenes with mud. “By hand we made baby Jesus, the Virgin … just on our own,” he says with a laugh. Amalia Mamani, who was born in the Pacajes province in 1944, yearns for those years of her childhood when with her brothers and her grandfather they molded the whole Nativity scene with mud, including themselves in the “holy family”. “With mud we made the little boy, the Virgin and Joseph. Also the animals: bulls, lambs, pigs, everything we had in the house … We also made our little house and us, with our aguayitos, chulitos (hats) and little weaving sticks, as if we were grazing the cattle. We put the little grass … It was very nice!” Recalls the woman. “My grandfather molded everything in very nice clay, the little bulls, the little flames, perfect! I had so much patience for that,” he adds. “Now it’s not like that, now everything is screen. My heart hurts, I would like to do all that little pottery again. As a child I never knew a gift at Christmas because it was not about that,” he says. Betty Terrazas agrees with her. “It was so familiar. My father worked a lot, I remember that I almost did not see him, but on Christmas Eve he was with us,” she said. Rosa recalls that another important episode of Christmas of her childhood were the Christmas carols, which throughout Christmas Eve went house by house, worshiping the Child Jesus. “They gave them chocolate and, sometimes, they paid him. They had a leader who collected,” says Narciso Quispe, who took part of one of those carols, that of Chijini. With his friends, he prepared weeks before December 24, making even his own musical instruments: the chullu – chullus, made with crushed soda lids and tied with a wire, a can of milk that made a drum and the quenas or pinquillos [wind pipe instruments]. You had to rehearse songs like Niño Manuelito and dress up … you also had to practice some good dance steps. “We used to go around El Prado, Plaza Murillo, everywhere. We stayed up all night worshipping Baby Jesus, going from house to house,” he says. “We had a boss who charged and distributed to us the next day what we earned, he was a friend of us. That little cash I gave to my mom. For us there was no Christmas because it was very poor,” adds the man who is 80 years old. Carol work was not easy because you had to prove that it was the best. That is why the groups of worshipers, who got together in each neighborhood, even unleashed a kind of “talent war”. The competition was tough and, sometimes, even aggressive. “You had to prove who was the best. Between groups we insulted each other, even when we were dancing to adore the Child “, affirms Narciso still enjoying the mischief. He does not remember if he ever received a child’s gift. “We were very poor,” he says. This entry was posted in Bolivia, Holidays, La Paz, Tourism and tagged bolivian Christmas decorations, bolivian christmas food, Bolivian heritage. Bookmark the permalink.